Add an elegant hint to your landscaping or garden path with the Esschert Design Finial Garden Fence. 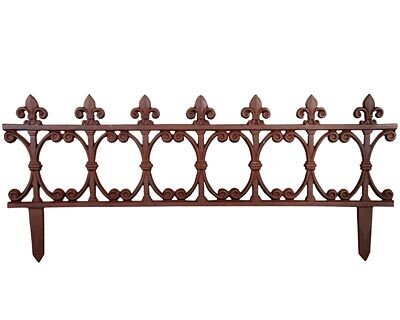 Each of these generous, 32" long fence sections brings timeless style to your garden, with their square horizontal supports and fleur-de-lis finials. Additional, curved bars between the horizontal supports create oval openings, for a delicate hint, and the aged brown tone of the units mesh with your foliage. The hardy, cast iron construction remains durable season after season, and the two, 4.75" long legs on each piece insert into soil for a stable display. Enhance your favorite flowers with a striking border using this Finial Garden Fence. Note: This case pack includes 4 of the Esschert Design Finial Garden Fence Sections.